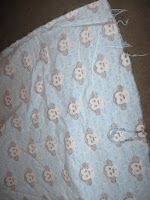 The poor college students guide to raising a baby: Sewing for dummie- PJ PANTS! Ok Ladies! I have come to the conclusion that I cannot teach you how to use your machine, or thread your machine, because every machine is different! So this tutorial starts AFTER you figure that stuff out..... 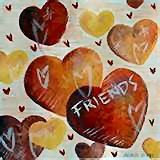 I hope that is ok! 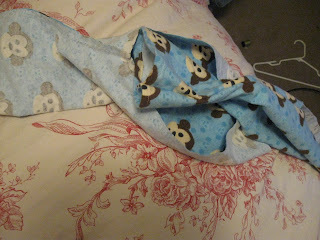 We are going to make the absolute easiest thing there is to make- PJ Pants! 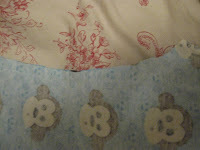 All you need to know how to do is a straight stitch, but if you know how to doa zig zag, that is a plus! For these pants you do not need a pattern, all you need is something like 1 yard or fabric, a peice of elastic 2 inches smaller than the person the pants are for's waist, and a pair of pants that fit the said person well. First off- find a pair of pants that fit your child (or whoever) well, but are kind of baggy and are long enough. 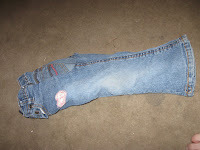 (Jeans work best) Take the pants, turn them inside out. You can see the lines where the crotch is sewn. Now comes the somewhat tricky part- take one of the legs and push it inside the other one- so now the pants basically look like they have 1 leg and the crotch is a curve - this is officially your pattern! You can either trace it out on a poster board, or you can just remember this trick! Works every time! 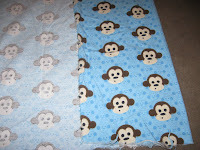 Take your fabric and put the colored side next to the floor. 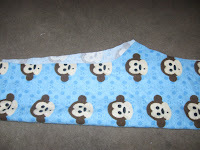 Fold over the edge just enough to fit your whole pattern on. You will not put your pair of pants (pattern) on top on the fabric with the side WITHOUT the curve up against the fold- this will make it so the pants only have 1 seam per leg! Make sure you have at least an inch of fabric under the pants so that you have enough for a hem! 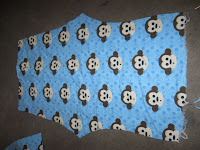 Now cut out the pattern- do this by going about 1 inch away from the pants and just follow along the general shape of your pattern peice, but add about 1 inch to the top where the wasteband would be too!- it should look something like THIS when it is finished- Make sure you cut 2 like this- you can actually use the first peice as your new pattern! 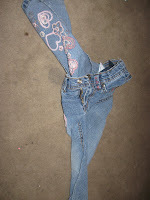 This part is optional- I personally like my pants to have a back and a front, so with both of your pants peices having the colored side facing each other- choose one side and clip about 1/4- 1/2 inch off of the crotch seam on ONE side- Yipee! Now you get to sew! Start off by taking an iron and pressing the bottom edge about 1/4 inch up and then fold that up and press that part too- this is called a hem! This is done to encase the raw edge and make it look finished. Now you are going to put it onto your machine. 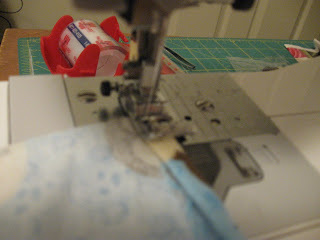 I like to use the edge of my foot to see make me sew a straight line. 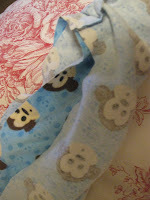 Just put the edge right onto the edge of your fabric and stitch- make sure you back stitch (go backwards) to knot the thread and keep it from coming apart.- Do this to both sides Yipee! Your first hem! 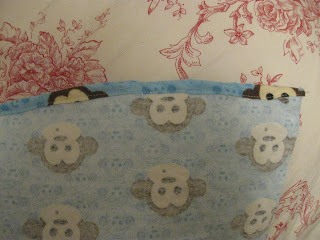 Now do this to the top edges too- This makes a nice finished seam! Remember not too much, just about 1/4 inch or less! 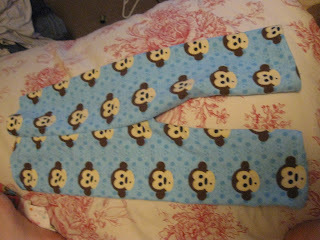 Now we start to construct the pants! 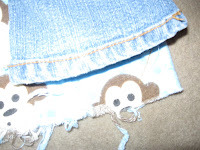 Take one of your legs and put the side edges together- you will now sew all the way up the straight part of the pants It will look like THIS- I then like to do a zig ag next to the seam I just did to make it fray less. Repete with the other side! 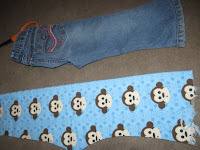 Now comes the really tricky part- you will take one of your pant leg peices and turn it inside out. Now you will stuff it inside the other one- so that both of the colored peices are facing each other. 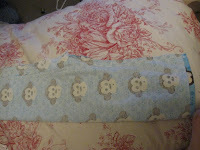 Match up the seams and pin the peice all the way around- it will look like a great big curve. 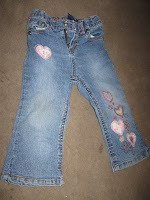 If you are scared, so take your pair of jeans you used as a pattern and look at them- this is EXACTLY how they are sewn! 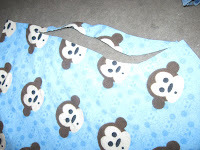 Take and sew this whole seam! (Obviosly you are going to leave the top part open silly!) This is what it will look like- Now- you are almost done! Now- you get to see your amazing project! Turn it right side out and admire it! Ok, so now you have the top- if you did it like me your top will be about 6 inches taller than you would ever need, but that is why you try your model. You want to be able to fold the top part down about 1/4 inch BIGGER than your elastic- so if it is tiny, you might want a bigger hem, if it is big, make sure the casing (the fold where you will slide your elastic into) is big enough. SO again, put the pants on your model, grab some pins and mark about where you would idealy want your waistband to be. Once you have that figured out, be careful not to poke the model! Now you will take your iron and iron it down. SO idealy you will have a fold and the bottom "raw edge" of the fold will be folded over so that there are no raw edges showing, and you will now sew this part close to the bottom of it obviosly, and you will leave a 1 inch opening so you can stuff your elastic in. You missed the part where I get all frustrated, roll the project up in a ball and throw it in the bottom of the closet for 2 weeks lol. I love that fabric...I swear, Canadian fabric stores are a year behind our American friends. 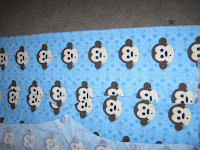 I can't find monkeys anywhere! Great tutorial, can't wait to read more :D ! You are amazing, Josie!! Thanks! I got it at Walmart..... lol they have pink too! Not to mention about 4 other different monkey things!